How can I define 2nd constraint of minimum sweep angle mathematically? Suppose we break the chain of the original robot $R$ into two: $R_1$ with two links (the first and the second links of $R$), $R_2$ with one link. $R_1$ is based at the base of $R$ while $R_2$ is based at your grasping point. See figure. When link 3 sweeps $60^\circ$, $R_2$ will trace an arc of a circle. Then what you want is that $R_1$ can also trace the arc traced by $R_2$. I think it is the case that this two-link robot can trace out any smooth curve within its reachable region (the circle of radius $l_1 + l_2$ centered at the case of $R_1$). (You will need to prove (or disprove) this, but I guess it's not too difficult.) So you just need to make sure that the arc drawn by $R_2$ lies inside the reachable region of $R_1$. Using some geometry, the above condition should be able to be written down as a constraint (or a set of constraints) for your optimization problem. Not the answer you're looking for? 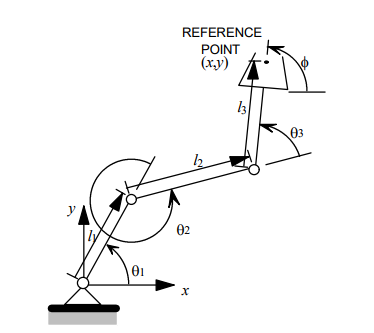 Browse other questions tagged robotic-arm kinematics inverse-kinematics forward-kinematics manipulator or ask your own question.